Why Choose Cortell’s Intelligent Business Solutions? Cortell’s expert financial and software consultants work with our clients to improve decision-making processes within their businesses. Cortell’s consultants offer you the skills, technologies, and practices for continuous iterative exploration of past business performance, to gain insight and drive business planning. The quarterly processes to reconcile, translate, eliminate, consolidate and report financial information is critical. Let Cortell assist you in streamlining your process. With non-financial information included with various financial reports, you gain a broad picture of your company’s business, market-position, strategy, performance, and future prospects. IBM Business Analytics software integrates fully with your ERP systems. 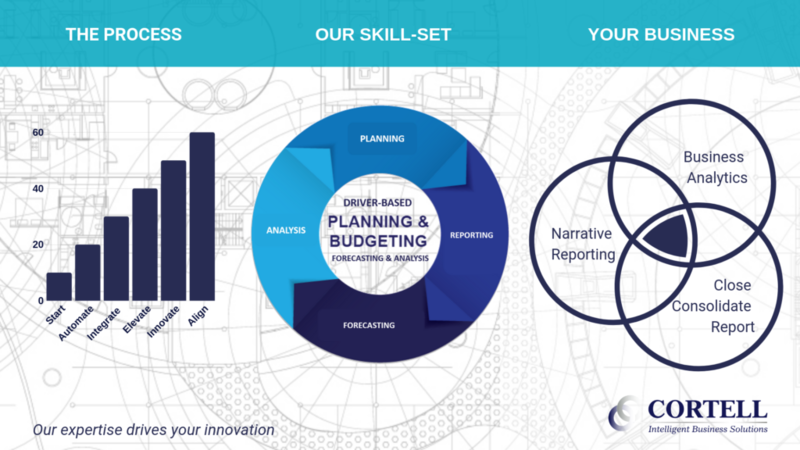 We help you to implement a financial model for driver-based planning, budgeting, performance reporting and scenario analysis. Financial close, consolidate, and statutory reporting. Stakeholder reporting including Integrated Reporting. Operational reporting and analysis for improved performance and operational efficiency. Forecasting and strategy correction that helps you to promote growth, profitability, and accuracy within your business strategy. Too many budget iterations & complicated spreadsheets?